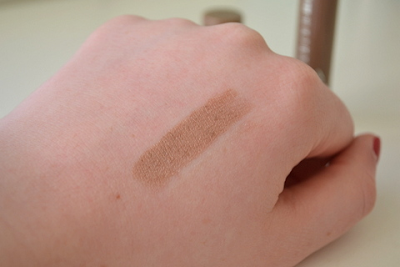 Helen Rambles On: MUA Colour Boost Eyeshadow Tint in A Girl Like Me - Reviewed! 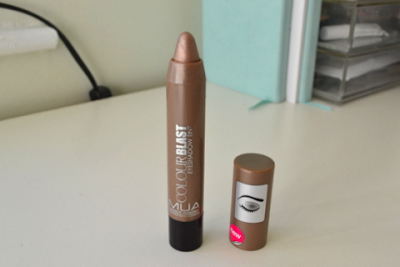 MUA Colour Boost Eyeshadow Tint in A Girl Like Me - Reviewed! For me MUA is a brand that is very hit and miss. Some of their products are very good and others are just plain bad. I also have a bit of a love hate relationship in how they seem to 'copy' a lot of other product. I think it's good because you can get a cheaper version of a hype higher end product but I also would prefer them to be a bit more original. Anyways, today I have a review of their version of the Clinique Chubby Sticks for Eyes; the Colour Boost Eyeshadow Tint. The packaging I like, it's is simple and comes in a crayon style design. I like the fact that there is a point on the crayon meaning you can be precise when applying. The product itself is a stiff waxy consistency, the fact that the product is hard means it does feel like you are tugging at the eyelid when applying. I would prefer a more creamy texture personally. Once applied onto the eye it can feel a little tacky and you can feel the product on your eyelid. The shade A Girl Like Me is a lovely taupey bronze shade, it reminds me a lot of MAC's Patina eyeshadow which I find the two paired together looks very nice. On it's own I find that the product does crease on me after about 4 hours, however with an eyeshadow over top it does last longer and it helps to get rid of that 'tacky' feeling. All in all i'm on the fence a bit with this one. I love the colour and the idea of the product, but for me the wear time and the texture of the product is not to my liking. Compared to the Clinique Chubby Sticks for Eyes you can definitely see a difference, the Clinique offering is a lot creamier and has a better wear time. I won't be picking up anymore shades of these but I will still use this purely because I like this particular shade. 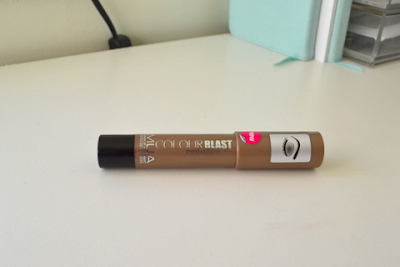 MUA Colour Boost Eyeshadow Tint in A Girl Like Me retails for £3.00. Have you tried these? What is your favourite type of eyeshadow crayon? I own this one and it's a BEAUTY...apart from thickness (which can be fixed) I love it.